The film version of Veronica Roth's novel Divergent is heading to theaters next March. The young adult novel series is set in a dark future where the citizens of Chicago are divided into five personality traits. When teens reach a certain age they must undergo tests and programming to be admitted into a specific class for the rest of their lives. Den of Geek.com rates Ray's Isaak Sirko as one of Dexter's most formidable opponents - second only to John Lithgow's monstrous Arthur Mitchell. Ray Stevenson is set to appear on the big screen as the character Volstagg, in the upcoming Marvel movie Thor: The Dark World. Ray has been talking about what fans can expect from the movie sequel and also hinted at the possibility of his character appearing in The Avengers 2. Speaking to Red Carpet News TV, when Stevenson said, "Asgard's under great threat, I mean the biggest threat it's ever had. The worlds have been turned upside down, the stakes are a lot higher, it's a lot grittier and darker. It's gonna be a lot of fun! I saw Christopher Eccleston on set two or three times." He added, "The man is just a construement sort of, malevolent, dark force. He's under so much ...make-up that took hours and hours [to apply]. It takes a lot, but he's bringing something very very dark and special to it. There's always potential [for Volstagg to show up in The Avengers sequel]. There’s always room for a big guy in the end." Ray Stevenson can be seen playing Volstagg in Thor: The Dark World when it is released on October 30 in the UK and November 8 in the US. As for The Avengers 2, the script is currently being penned by Joss Whedon and is expected to be released on May 1, 2015. Latino Review: How does it feel to be the Big Bad of the film? 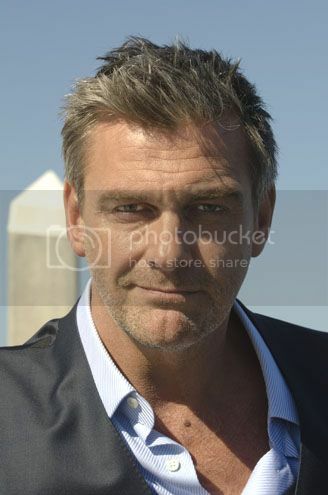 Ray Stevenson: It’s so much fun. I get to blow stuff up and shoot guns. I have a fight with that big man over there. My character is working with Cobra Commander. He’s very much a right hand guy, really. But he is a mercenary type of character, basically. He was an ex-Joe and he’s now going for the highest bidder. Now he dresses better. The Academy of Science Fiction, Fantasy and Horror Films has announced the nominations for the 39th Annual Saturn Awards and Ray has been nominated for Best Guest Starring Role in a Series for his recurring role as Isaak Sirko on the Showtime original series Dexter. Check out these new promo pics of Ray as Ukrainian mob boss 'Isaak Sirko' from the next three episodes of Dexter, Ep. 03 "Buck the System", Ep. 04 "Run" and Ep. 05 "Swim Deep". (Click images to enlarge). Showtime's New Dexter Podcast Includes Interviews With Series Stars; Dexter Fans Can Now Test Their Knowledge And Play Weekly Games On Facebook With "Dexter's Disciples"
With the premiere of the seventh season of its No. 1 rated series DEXTER, Showtime Networks has launched two new digital initiatives to give the series' fans even more access to their favorite show. (click to enlarge) Showtime has released a series of promo photos of the upcoming season 7 of Dexter, including this one of Ray from Episode 7.03 titled “Buck the System” which airs on October 14, 2012.